Over the next couple weeks, we're going to be talking A LOT about the amazing benefits of fruits and vegetables in the meeting room and working towards getting in a minimum of 5 servings a day - are you up for the challenge?? Fruits and veggies are like mini superheroes packed with goodness! The antioxidants (like vitamin E, C & beta carotene) contained in fruits and veggies help your body to stave off various diseases and fight the free radicals. You can read more about the benefits of fruits & veggies here or in Ultimate Foods for Ultimate Health or 10 Steps to Healthy Eating. If you need a little more inspiration be sure to check out this post and if you are a visual person and want to track your progress in this challenge, be sure to check out Heather's chart. 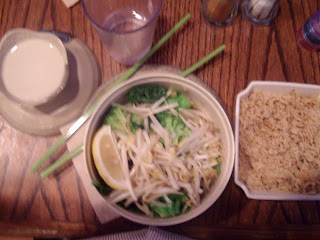 My yummy steamed greens from Fresh before the Fresh screening. 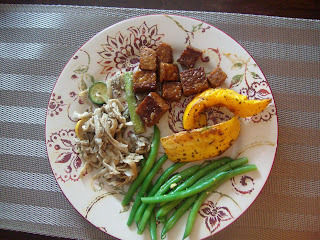 Leftover pasta with green beans, squash and tempeh. 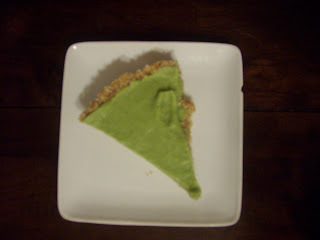 And a slice of my first homemade raw dessert - raw key lime pie! 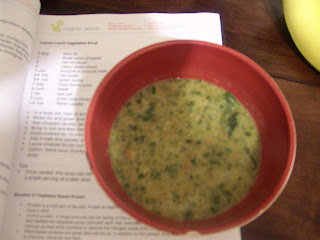 Such a great recipe from Meals that Heal Inflammation (review coming this month!) 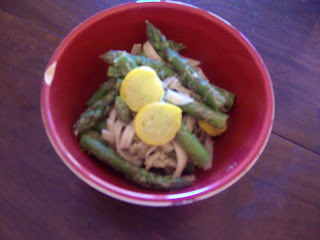 It was really easy to make and absolutely delish! What is your favourite way to add COLOUR to your meals and snacks? We talked about this in this mornings meeting too. Our leader set a challenge for us each to have minimum 3 different colors per day. I am looking forward to this challenge. My favorite way to add color to breakfast is with berries, I love mixing, strawberries, raspberries, blueberries and blackberries with yoghurt and cereal. 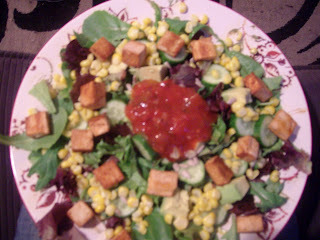 Also I like to make my salads colorful, the nicer they look, the nicer they taste! ummm.... YUM! I eat with my eyes so color is muey importante. I have yet to try the banana soft serve recipe because all of our frozen bananas keep finding their way into my husby's green monsters! Heaven forbid he not be able to drink one every morning. I've created a monster! Loved the WW meeting on Saturday, Ash! 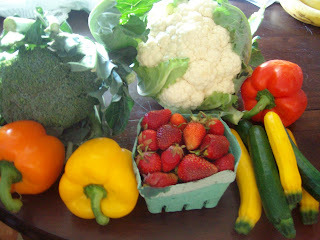 On our way back, we stopped in at the Danforth market and picked up some very colourful fruits and veggies! Last night for dinner we had a colourful spinach salad with chicken and tons of veggies. This morning, an egg white omelette with lots of vegetables. Tonight, a hoisin stirfry with beautiful green snap peas, carrots and mushrooms. Thanks for the inspiration! LOVING all these colorful fruits and veggies! 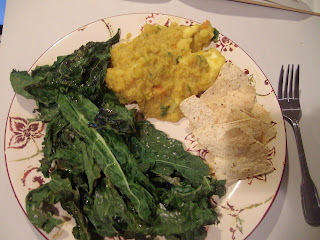 I totally agree in the importance of getting in as many serving as possible of both food groups. The benfits are sooooo amazing, and there are so many to choose from! 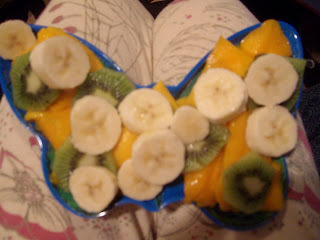 I love creating colorful fruit salads. The more color, the better! Thanks for posting this topic. I was sad to have missed the meeting this week but i'll be there this week! OMG! Thanks for the banana soft serve link... I ordered 2kg of organic bananas last week, not realising exactly how many bananas 2kg is and wasn't sure how to go about using them all before they get to "banana cake" stage! This looks amazing, I can't wait to try it! As far as adding colour to my day goes... I'm a huge fan of bento boxes. So, instead of the standard aussie lunch of a sandwich, piece of fruit & chocolate bar or mini packet of chips, I normally fill my bento with a variety of things in snack-like portions. E.g. One layer of bento is normally divided in two and reserved for morning tea & afternoon tea. Morning tea is normally a fruit salad (berries, melon, banana... whatever I've got at home) and afternoon tea is raw veggies (snow peas, daikon radish, capsicum etc.) and a tablespoon or two of mixed nuts/seeds. Lunch takes up the other layer in my bento and varies greatly but is always veggie based! I am blinded by all the wonderful colors! Awesome pics, I will definitely be thinking about this when I am preparing dinner tonight. I always try to have a variety of color in my diet! 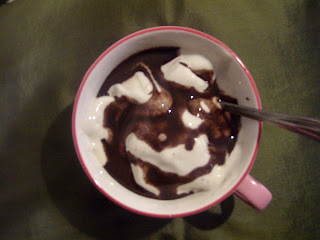 :) Love the pics, everything looks delish! I LOVE the summer. The colourful, fresh produce is divine to look at and to eat. I like radishes for a little crunch and unique taste in a salad. Right now, cherries are especially good too. It looks like red is in. In preparation for this Saturday's WW meeting, I thought I'd show you some of the dishes I made and how colourful my food was this week! Click my name and check it out. See you this weekend!